PCs In Paradise provides Computer Services for individuals and small businesses located throughout Pompano Beach, Fort Lauderdale and many of the surrounding areas. Meet with you to evaluate and understand your business. while maintaining effective IT risk management. technology to help you maintain your competitive edge. • On-site Computer Repair – Pc’s In Paradise understands the value of your time. We offer exclusive On-site Computer Repair. We come to you so you don’t have to pay someone to come to us. • Wireless networking and router installation – Anyone with a PC, Phone, Tablet or even home appliances utilize wireless networks. We can help setup, configure and re-work wireless installations, some of which may be out of date. Internet providers will not always automatically notify you of updates to network devices. Many times these devices are costing you valuable time while you are waiting for a connection”. • Internet configuration | DSL | Cable | Wireless 4G | – The type of internet connection you choose depends on your needs. Everyone wants an extremely fast connection for web browsing, gaming, streaming movies and many other reasons etc. Prices will vary depending on the type and speed of your connections. There is a plethora of connection types to choose from. The most common types for the Pompano Beach Ft. Lauderdale area are DSL and Cable. Pc’s In Paradise can remove most Viruses and Malware with programs designed specifically for this purpose. If you think your machine is infected, don’t wait to get help. The longer you wait the worse it will get in which case a repair turns into a rebuild. See tech support page for recommendations about removal of malicious software. How do viruses and malware get onto your computer? You often install it yourself. When you download that free software program you usually have to sign an End User License Agreement (EULA). Most people click on the “accept” button without reading the EULA. EULAs are usually extremely long, filled with legal jargon that people rarely read. Often they will tell you that by accepting this free software, you agree to let them install other programs on your computer or share information about you with others. When you “accept” the free software, you’ve accepted the conditions of using it, which includes permitting them to install this “malware” on your computer. If you uninstall the malware, the free software may no longer work. Be careful when installing free programs. A good rule of thumb: If you don’t need it, don’t install it. NEVER Update ADOBE FLASH PLAYER from a webpage message that suddenly appears or a popup that appears on your desktop. Always go to www.adobe.com, click on menu and then click Adobe Flash Player at the bottom of your screen. NEVER Update JAVA from a webpage message that suddenly appears or a popup that appears on your desktop. Always go to www.java.com to get the update. NEVER Install a windows media player update unless you are 100% certain that it came from Microsoft. Some companies use “windows” as a name in order to trick you into installing malicious programs. NEVER Install programs without reading the EULA (End User License Agreement). NEVER Install a program unless you are absolutely sure of its origin. PC’s In Paradise can make recommendations on whether you should upgrade your current computer or simply purchase a new one. That is a personal decision but it depends on a number of factors. How old is your computer? What specialty software do you have installed. OEM (Original Equipment Manufacturer) in most cases cannot be transferred to the new machine. You must re-purchase the software. Many times the software costs as much or more than the new computer. Retail purchased software, on the other hand, can be installed on the new machine, provided it is compatible with your new operating system. If you are upgrading the hardware (more memory, larger hard drive, better video card, better sound card, etc.) it can usually be done cheaper than purchasing a new machine. Again, you must consider the age of the machine. In some cases it may be necessary to rebuild the software in a computer due to damage incurred by malicious software, file corruption or hardware issues (hard drive failure). Though rare it can happen. 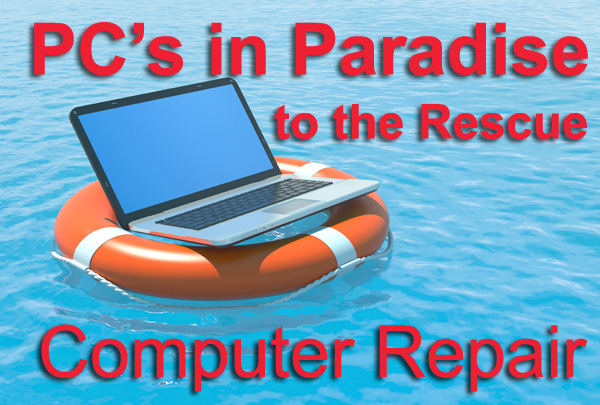 Pc’s In Paradise can totally rebuild the software in your computer and restore to factory specifications. There is nothing worse than having your computer crash and for your files to be inaccessible. We can retrieve files on failed drives more than 95% of the time. For the 5% we can’t recover we have recommendations for recovering that data as well. Need to login to your office computer from home with no monthly fee? Pc’s In Paradise has access to software in order to set you up with remote connectivity, allowing you to connect to your office computer from home. There is no charge for the software to accomplish this, and there is no monthly fee. The only charge to you is the installation cost, which can vary based on the type of equipment.